is situated on a hillock off Senapati Bapat Road. This temple of the goddess attracts droves of devotees during the nine-day Navaratri festival in October. The historic palace of the Peshwa (Prime Ministers) rulers, became the seat of political power during Bajirao reign and became so conspicuous that to this date the palace has become the symbol of the city and its culture. Built in 1736, the Shaniwar Wada was once the palace of the great Peshwa rulers. he Osho International Commune The Osho International Commune is in Koregaon Park, attracting thousands of foreigners wishing to take part in the meditation courses organized by the Ashram. The Commune was founded by Osho Rajneesh who died in 1990. His samadhi is situated in the Ashram. The commune has beautiful gardens open to the public in the mornings and evenings. Pune is a city located in the western Indian state of Maharashtra. Pune is 8th largest urban agglomeration in India with a population of 4.5 million, it is the second largest city in the state of Maharashtra. It is located roughly 150 kilometers east of Mumbai at an altitude of 560 meters above sea level. It is situated at the eastern edge of the Western ghats on the Deccan plateau. Pune is widely considered the cultural capital of Maharashtra Pune has a reputation for its several esteemed colleges and educational institutions â€” for this reason it is called the Oxford of the East (or 'Oxford of India'). It has a very strong presence in the automobile sector and is on its way to consolidate its position as the 'Detroit of India'too. It is now home to many software and IT companies. Pune is well connected by air, rail and an express highway to Mumbai, the commercial capital of India, as well as to other prominent metros and cities in India. 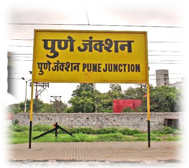 Pune has three major bus stations viz., Railway Station, Shivajinagar & Swargate Bus Stand. Many private airliners have their booking offices in Pune and also operate from here. They are shortly commencing International flights to Dubai & Singapore. The city has an excellent cosmopolitan mix catering to the largest numbers of student population in India, coming from different states and backgrounds. With its safe and secure living conditions one does not feel apprehensive to enjoy the abundant nightlife available.